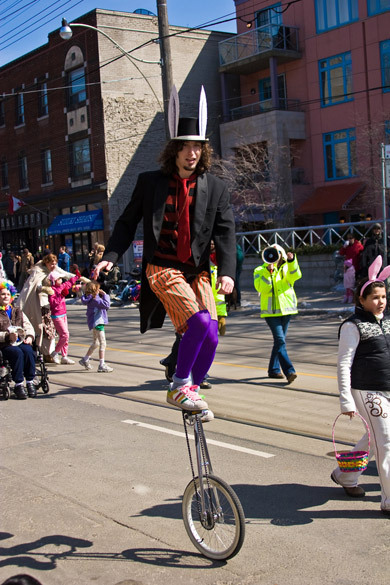 Jester unicyclist from last year’s Beaches Easter Parade by Jr. Miller from the Torontoist Flickr Pool. FAMILY: The forty-third annual Beaches Easter parade, hosted by the Toronto Lions Club, snakes its way along the Queen Street East area through to Woodbine this afternoon. Organizers anticipate thousands of participants, in addition to a plethora of bands, floats, bicycles, motorcycles, trucks, and performing animals. The Easter Bunny also promises to make an appearance. Parade begins on Queen Street East at Munro Park Avenue, 2 p.m., FREE. THEATRE: Today is the last day to catch Mark Shyzer’s single-performer, multi-character show, Fishbowl: a concise, expansive theory of everything. Billed as “a collision of quantum physics and cutting social satire,” the production examines five characters in search of meaning and connection who make an unexpected collision in the dark. Caustic comedy ensues between a nerdy high school genius, a pregnant jazzercise instructor, a hormonal teenaged hipster, a middle-aged barfly, and a retired physics teacher. Buddies in Bad Times Theatre (12 Alexander Street), 2:30 p.m., P.W.Y.C. THEATRE: Aboriginal playwright Daniel David Moses’s Almighty Voice and His Wife also finishes its run today. Moses’s seminal play tells the tale of the legendary nineteenth century Saskatchewan Cree, Almighty Voice, an accidental martyr hunted by the Mounties after he killed a stray cow. This new production comes from Native Earth Performing Arts, a non-profit organization dedicated to the creation, development, and production of artistic works about the Aboriginal experience in Canada. Theatre Passe Muraille (16 Ryerson Avenue), 2:30 p.m., P.W.Y.C. ART: An eerie art project about mourning and loss is being shown on the Clear Channel video billboard at Yonge and Dundas. Robin Pacific’s The Presence of Absence connects different people’s grief through an interactive website, where the public can post notes about loved ones who died and select an accompanying image. The images come from artworks based on the words “Love,” “Remember,” and “R.I.P.,” created by members of the Jane/Finch community and members of Bereaved Families of Ontario (BFO). The culminated project will be broadcast from the window of the BFO office in the Annex from April 14–20. Billboard slide show at Yonge and Dundas, FREE. FILM: The Canadian Black Film Festival screens Saving God, directed by Ryerson University graduate Duane Crichton. The film follows the troubled journey of Pastor Cane (Mission Impossible’s Ving Rhames), who serves fifteen years in prison for manslaughter and returns home to help rebuild the community he left behind. The film launches the festival’s Film Club screening series, which showcases black world cinema from both Canada and overseas. It will be introduced by its producers and writer, and followed by an audience Q&A session. National Film Board of Canada (150 John Street), 1:30 p.m., $8 or $6 students/seniors. FILM: The Wright Stuff film series continues with two movies dedicated to the portrayal of Toronto on film. In town to shoot Scott Pilgrim vs. the World, British director Edgar Wright has been curating the series at the Bloor Cinema, choosing David Cronenberg’s The Brood and Don McKellar’s Last Night for tonight’s double-bill of Torontopocalypse cinema. Kellar is confirmed as a special guest. Bloor Cinema (506 Bloor Street West), The Brood at 7 p.m., Last Night at 9:30 p.m., single tickets are $8 members/$11 non-members, double bills are $14 members/$19 non-members.